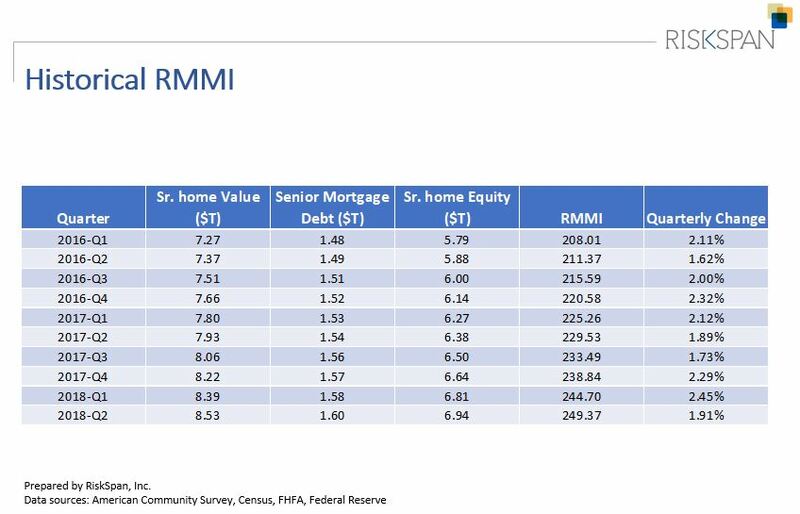 WASHINGTON (September 21, 2018) – Housing wealth for homeowners 62 and older grew to $6.9 trillion in Q2 2018, an increase of $130 billion in senior home equity over Q1 2018, reports the National Reverse Mortgage Lenders Association today in its quarterly release of the NRMLA/RiskSpan Reverse Mortgage Market Index. The RMMI rose to 249.37 in Q2, another all-time high since the index was first published in 2000. 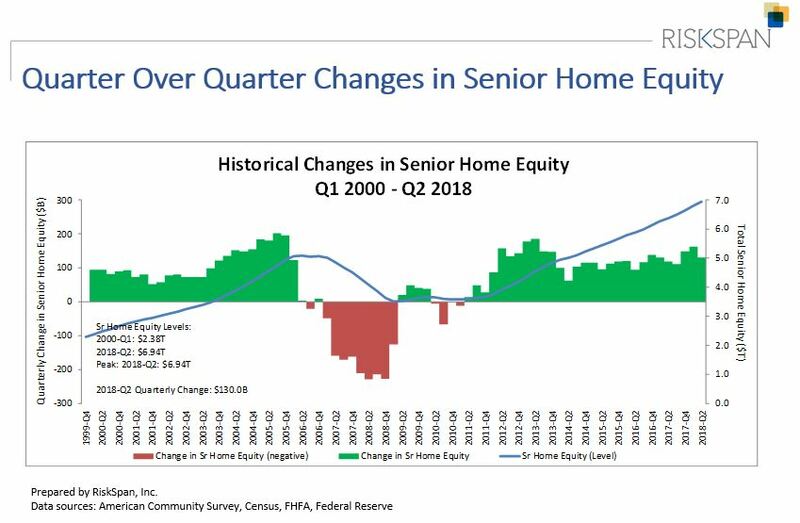 The increase in senior homeowner’s wealth was mainly driven by an estimated 1.7 percent or $143 billion increase in senior home values, offset by a 0.8 percent or $12.8 billion increase of senior-held mortgage debt. NRMLA President and CEO Peter Bell commented that the equity accumulated in a home, to many American families, represents the largest component of personal wealth. “If you consider that the typical retiree household might have one or two incomes from Social Security, a modest pension and/or limited income from low-yielding fixed-income instruments, and, perhaps, a diminished 401(k) account, then home equity becomes their greatest asset and an important resource for funding their future,” added Bell. Reverse mortgages are available to homeowners age 62 and older with significant home equity. They are a versatile financial tool seniors can use to borrow against the equity in their home without having to make monthly principal or interest payments as with a traditional “forward” mortgage or a home equity loan. Under a reverse mortgage, funds are advanced to the borrower and interest accrues, but the outstanding balance is not due until the last borrower leaves the home, sells or passes away. The National Reverse Mortgage Lenders Association (NRMLA) is the national voice for the industry and represents the lenders, loan servicers, and housing counseling agencies responsible for more than 90 percent of reverse mortgage transactions in the United States. All NRMLA member companies commit themselves to a Code of Ethics & Professional Responsibility. Learn more at www.nrmlaonline.org. RiskSpan offers end-to-end solutions for data management, risk management analytics, and visualization on a highly secure, fast, and fully scalable platform that has earned the trust of the industry’s largest firms. Combining the strength of subject matter experts, quantitative analysts, and technologists, the RiskSpan platform integrates a range of data-sets–including both structured and unstructured–and off-the-shelf analytical tools to provide you with powerful insights and a competitive advantage. Learn more at www.riskspan.com.